Isa Miranda (5 July 1909 – 8 July 1982) was an Italian actress with an international film career. Born Ines Isabella Sampietro in Milan, she worked as a typist whilst attending the Accademia dei Filodrammatici in Milan and training as a stage actress. She went on to play bit parts in Italian films in Rome. 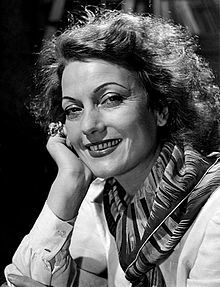 She changed her name to Isa Miranda and success came with Max Ophüls' film La Signora di tutti (Everybody's Woman) (1934) in which she played Gaby Doriot, a famous film star and adventuress with whom men cannot help falling in love. This performance brought in its wake several film offers and a Hollywood contract with Paramount Pictures. There, billed as the "Italian Marlene Dietrich", she played several femme fatale roles in films such as Hotel Imperial (1939) and Adventure in Diamonds (1940). She returned to Italy soon after the outbreak of World War II and continued to act on the stage and to make films. In 1949, she starred in René Clément's The Walls of Malapaga, which won an Academy Award for the most outstanding foreign language film of 1950, and for Miranda, the Palme d'Or at the Cannes Film Festival. Another success of that period was La Ronde (1950), also directed by Ophüls. Her career took her to France, Germany and Britain, where she frequently appeared in TV films, including The Avengers. Other notable film appearances include Siamo donne (1953), a portmanteau film where Miranda shares the screen with Anna Magnani, Alida Valli and Ingrid Bergman; Summertime (1955); Gli Sbandati (1955); La Noia (The Empty Canvas, 1963); The Yellow Rolls-Royce (1964); The Shoes of the Fisherman (1968); and Liliana Cavani's Il portiere di notte (The Night Porter, 1974). Miranda was married to the Italian director and producer Alfredo Guarini until his death in 1981. She died in Rome in 1982, three days after her 73rd birthday. Wikimedia Commons has media related to Isa Miranda.